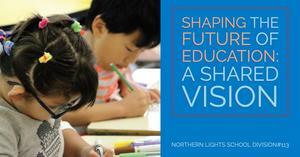 Community Engagement Sessions will be held by Northern Lights School Division #113 throughout the school division. The purpose of these events is to gather feedback from all interested stakeholders in the establishment of the vision for Pre-K through Grade 12 education over the next decade. What knowledge, skills and abilities do students need to be prepared for their future life and learning? Why are these important? What is working well now in Saskatchewan’s school system that prepares students for their future? What needs to change in Saskatchewan’s school system to better prepare students for their future? Feedback will be collected and no names will be personally matched with any comments. The summarized data will then be submitted to the Provincial Education Plan Planning Team, resulting in a determination for education over the next decade. There will also be an online option for providing feedback with those same questions. As soon as the link is available it will be sent to all schools via social media.